A fabulous Roberto Coin bracelet is a great way to jazz up an outfit. 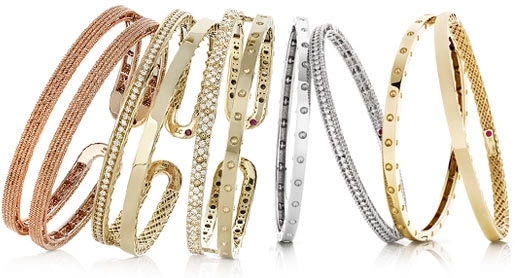 The bracelets, cuff, and bangles from Roberto Coin are crafted from Italian gold in 18kt white, yellow or rose gold. They can be smooth or linked. They can be adorned with diamonds or other gemstones. They can even be stretchy! Your style will dictate the Roberto Coin bracelet that is just right for you. There is vibrant color in the Ipanema and Shanghai collections from a mix of semi-precious gemstones. Go bold with one of these pieces. Sleek, elegant designs are found in the Golden Gate and Treccia Incarata collections. They feature striking woven textures and are adorned with white diamonds. The bangles in the Martellato collection have a gently hammered surface for the shabby chic. A stain finish and diamonds make the bangles in the Granada collection more feminine. The Chic & Shine collection along with the Pois Moi collection offer strong geometric shapes that can be dappled with diamonds. Bracelets in the Primavera collection have a golden weave that is perfect for everyday use. Cento is prized. A Roberto Coin bracelet pairs well with every style on any occasion.